Today's music is straight from Korea via The Factory here in Lufkin: GALAXY EXPRESS. 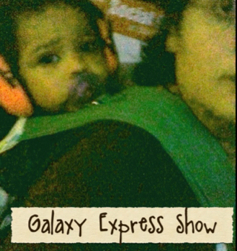 Ravebaby and I had the pleasure of seeing Galaxy Express live back in March. This video is a promo/preview of the documentary they filmed on that tour. If you look close enough you'll catch a glimpse of Max from Social Bliss in the video. I have no clue what the song is about but the passion is enough to nearly have me in tears. This video shows the softer side of Galaxy Express. They rock hard and their shows rock even harder! Look them up YouTube. I love Naughty Boy. I can almost sing the whole thing. I have no clue what I am saying but I love the song.